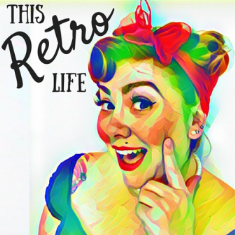 We’re kicking 2018 off with a bang here at This Retro Life. You are about to meet a woman with big hair, big personality and a big passion for old things! In her life, vintage is a family affair with her mum and dad both sharing and embracing their own love of cars and fashion. Unlike so many of us, she stuck it to the man and started dabbling in vintage fashion while she was still in high school and now her style is refined, sophisticated and the inspiration for so many others. Ladies and Gents, meet Miss Cherrybomb.